Day 2 of the Northern Thailand part of the Smartours tour (ending in Chang Mai). 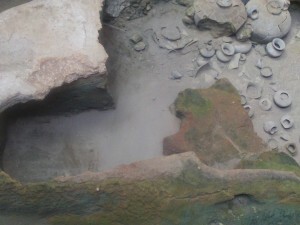 Today is Sukhothai, ancient ceramic kilns, textile museum, Lampang and Wienglakor hotel. 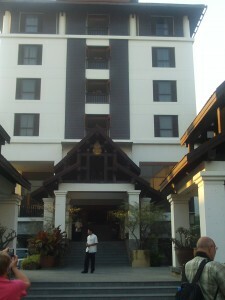 Today we left Topland Hotel early-ish (7:30 or 8) and headed to Sukothai. 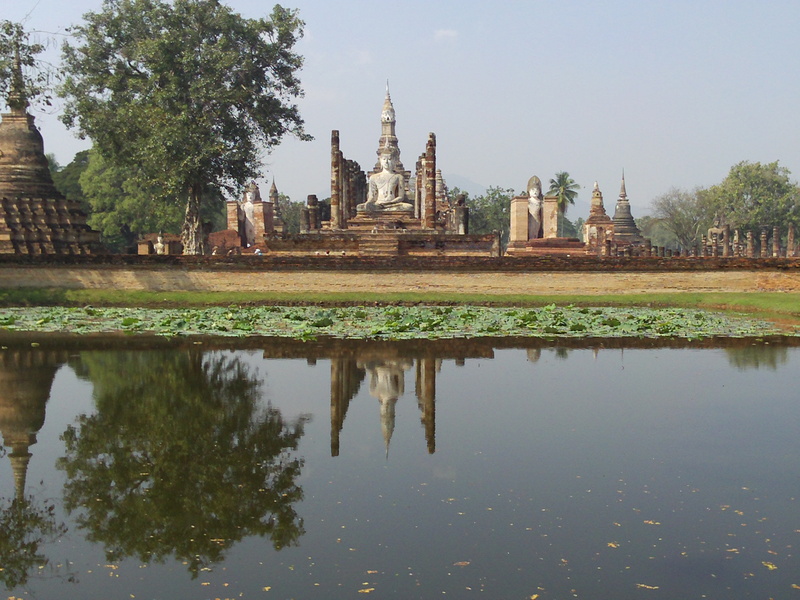 The Sukothai Historical Park, a UNESCO World Heritage Site, was the site of the first capital of Siam (Thailand) Sukhothai Kingdom in the 13th century. 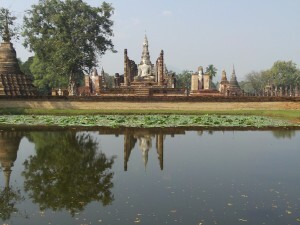 It had many stupas and buddha statues and beautiful ponds and landscape. You have seen typical buddha statues, of which there were many. But this was an interesting statue of buddha of a type I had not seen before. It is the Walking Buddha (I can’t remember, was it for walking meditation?) and was very feminine in form. This is the way the Thai Buddhas look. This is because the thought was that the feminine figure was the most graceful and beautiful of all human shapes. It did not mean that he was feminine or female, just that he was graceful and beautiful. If you follow the link above, you can see the list of desired attributes. Sukhothai artists tried to follow the defining marks of a Buddha set out in ancient Pali texts. 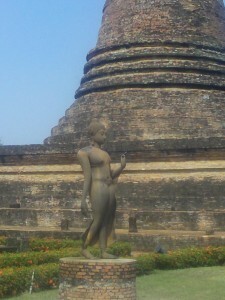 All the statues in Sukothai were feminine in nature. You could rent bicycles and cycle around the grounds as they are very large, but it was pretty hot for cycling when we were there, although a lot of people were doing it. We stopped for lunch at another buffet which I can’t remember, exactly. I think it outside in a garden as were several of the lunches that were buffets. I did write down what we had to eat though! We had bean sprout soup, morning glory veggie (green stalk type veg), chicken, glass noodles, rice, watermelon, pomelo (sp?) – a delicious fruit that is like a large, mild, sweet grapefruit (that I could not get enough of), beer and water for 680 baht for both of us (or about $20). As usual, it would be very expensive to get the same quality food here in the US. The next stop was a museum to view ancient ceramic kilns that were excavated and left in their original condition. It was fascinating to see and understand how they created kilns to cure their pottery. They are known for their celadon (sp?) green ceramics. The display of the kilns was very well done. Then we visited the textile museum (and shop) and met the owner, a very nice and funny man. It was nice that in most of the places we went, we got to meet the owner/creator. 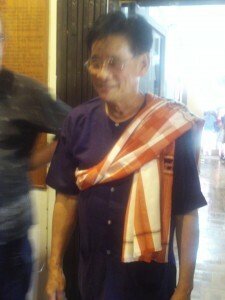 He was dressed in the clothing of Laos, a bordering country. Most of the people who owned these places we visited did not speak English but with the great help of Nok, our excellent guide, we were able to talk to them very well. 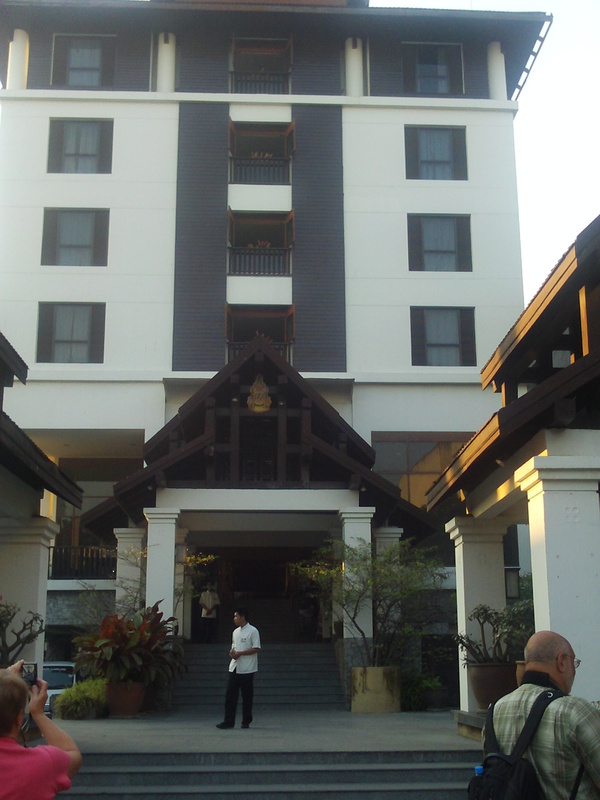 And then we went to our hotel in Lampang, the Wienglakor hotel. The hotels on the road are not as nice as the one in Bangkok. This is probably because they are in small towns that are just stopovers on the way to somewhere like Chiang Rai or Chiang Mai. The Wienglakor hotel had a very noisy air-conditioner and an interesting, unlabeled (in our room) slot that you put the key in order to turn the lights on. That is actually fairly common, but we had not encountered it yet and it was unlabeled so it took us awhile (and asking another room) to figure out how to work it. It was funny because we started wandering down the hall looking for someone to ask and we found 2 of the guys on their knees peering at a little hole in the wall by the floor behind a baseboard that was pulled off. They had accidentally dropped their key into the slot that turns on the lights instead of inserting the attached plastic bit. They MacGyvered the key out of the wall with various pens, tweezers, pocket knives and other tools. There were very cool horse drawn carriages in Lampang that you could rent cheaply to go around town and Lampang was a pretty little town. We wanted to go out and look around but yet again we were tired from a long day and laid down when we got to the hotel and didn’t wake up until about midnight (and then went back to bed). I wrote a post before this one about the Wienglakor hotel and misc. My posts are out of order because I had a hard time finding internet so sometimes they were current and sometimes they were catch-up. When I am all finished, I will make a travel page for them and put them in the correct order. Tomorrow is the Golden Triangle, Chiang Rai, a ride on a boat on the Mekong river, a stop just across the border of Laos and Myanmar (Burma) and various occupations and handicrafts. Tagged 2010, ceramic kilns, february, lampang, smartours, sukhothai, textile museum, thailand, tour, travel, trip, vacation, wienglakor hotel. Bookmark the permalink.